This Mattress is made by Otis Bed Manufacturing, well known for producing the finest quality futon mattresses in the industry. All Otis products are performance tested to verify quality. The Otis Athens Mattress is an exclusive specialty product you won't find anywhere else. Manufactured for everyday use, the matress features a "flip-able" design. Its soft side consists of material built for comfortable sitting on one of our many futon sofa frames. When you open the futon up as a bed, simply flip the mattress over for a firm and supportive sleep surface. The Athens Mattress is framed with a 2-pound high density foam, insulating its low profile pocketed coil spring for the highest quality in durability and support. The Athens Mattress is encased in a soft, cream-color polyester fabric on sides and soft side, and high-quality white polypropylene fiber blend fabric on the firmer side. Taped edges ensure a proper fit and finish for years and years. � 12 inches of quality fill materials compressed to fit inside an 8 inch case. � 6 inches of convoluted high density foam. � Low profile pocketed coil springs are highly elastic, durable and supportive. � "Flip-able" design allows for softness on one side and firmness on the opposite surface. � 100% polyester fabric (cream color) on the sides and soft side. � High-quality white polypropylene fiber blend fabric on the firmer side. � Layers of Flame Retardant Rayon insures compliance with Federal Standard CFR 1633. � Tape edge process insures a proper fit and finish of the mattress cover. � Machine tufting reduces thickness of mattress and retains quality look & feel. � Durability for 10-12+ years, designed for everyday use. � 10 year limited manufacturer's warranty. � Made with pride in the USA. � Compression packaged and rolled before shipping. * Size is measured before vacuum packaging, please allow 7-10 days after unpacking for expansion. Otis brand futon mattresses have squared edges and work best with 10" covers. 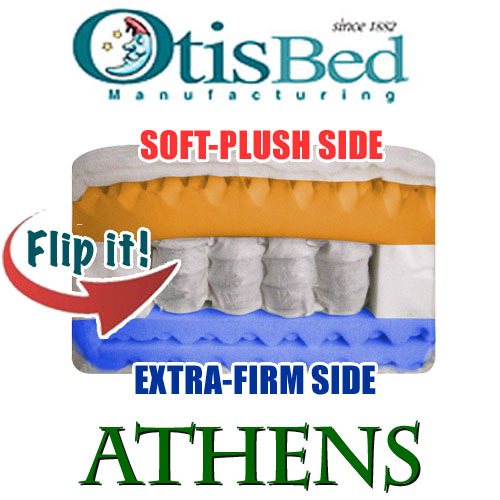 Otis Athens futon mattresses are drop-shipped directly from the manufacturer, usually within one week.